After signing to Columbia they concentrated on putting out their first album which had a considerable Byrds influence and some good original compositions, notably Jim Fair's Ben Franklin's Almanac. It also contained some well done cover versions of classics like, Hey Joe, If I Needed Someone, We Gotta Get Out Of This Place, We'll Meet Again and She Don't Care About Time. It peaked at No. 192 in the U.S. Album Charts. Howdy folks. Here's my most recent collection of music for your discerning ear. Unlike the other albums of my own, this one probably reflects more the sounds that you hear in the psychedelic garage. About half of this was recorded earlier this year in my Japanese mountain layer while the other half ended up on tape in the past month back in my hometown of Atlanta, Georgia. 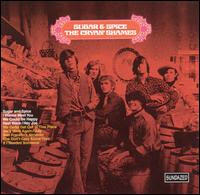 Attempting to channel the West Coast Pop Art Experimental Band and other wacky nuggets, "Future Quake" was composed and recorded for a radio show of the same name out of Nashville, TN. Their website is at www.futurequake.com. "Focus on the Sun" is my tribute to the lovable, but endearingly naive bands of the 60's and beyond. Meanwhile, you'll find that I haven't given up on my shoegazer trip on "Elliptical." I carted out a few old compositions as "Spinning Top" and "Your Kingdom" are a direct result of my introduction to Syd Barrett and Flying Saucer Attack 10 years ago. I'll stop ranting, so download this and send me your comments. As always, I'd be more than happy to see this posted elsewhere too. About 10 years ago I saw the Olivia Tremor Control in concert. Off to the side of the stage they had a small booth that you'd step into which included a microphone. The idea was that you'd record your dreams and that the band could use it for later recordings. Unfortunately, I didn't make it in time for this sole album that utilized the dreams. But you'll hear the murmur of dreams scattered throughout this recording, and the whole mix is a rather tripped out experience. Obviously intended to be heard on vinyl, this album is divided into two side long tracks. The music exists in a netherworld between the full on psych rock of the band's proper albums and the ambient blur of Explanations II. When you get down to it, the flow of the disc reminds me a whole lot of Frank Zappa's Lumpy Gravy. Don't let that scare you off as this album has a far more organic and less pretentious sound that Zappa's opus (and if you already dig Lumpy Gravy then you're set). 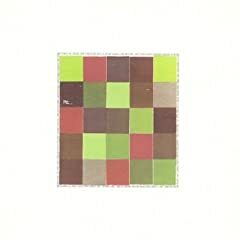 We hear a lot of sound collages (featuring barely audible dreams) and on a few spot the band actually kicks into gear for a few moments for a more inviting run of music. The beginning of side two especially stands out with its skittering drum beat and twin theremins. As always with the OTC, you're hopefully attuned to and open to the sound of rapidly flying tape loops and sudden reversing sounds. At a base level this is a pretty top flight psychedelic musical experience. Even more experimental and out there than the Elephant 6 collective's reputation (of which OTC was a major part of), this Tour EP is a pure strain of strange music. It's a shame that this recording is all but forgotten as it adds an enlightening wrinkle to an already great band's legacy. I pretty much consider the Olivia Tremor Control the best psychedelic band to record during the 90's. Admittedly, I may be a little biased as I was a student in their home base of Athens, Georgia during their prime. Regardless, you need to hear their two long-players, Dusk at Cubist Castle and Black Foliage, if you haven't already. This strange, long out-of-print release cropped up as a bonus disc that came along with the first pressings of Dusk at Cubist Castle. The rumor was that the disc was to be played along with the album for an extra layer of freakiness. Considering that the tracks don't match, nor does the timing of the album, I personally put about as much stock in that idea as the Wizard of Oz/Pink Floyd think (the end of 2001 with "Echoes" does work well as a side note). Seeing as this is an ambient album, I suppose you have nothing to lose by playing both, but we'll look at this as a singular entity. If you are already acquainted with the OTC, you won't find much of their signature sound present here. This is an ambient exercise very much in the mold of Brian Eno's more amorphous albums. Listening to this either requires a zen-like focus, or you can let it roll purely as background music. There are nine tracks with various tonalities and varying degrees of background noise (much of this was supposedly recorded on an Athens porch), but there's not much to say about the tracks individually. 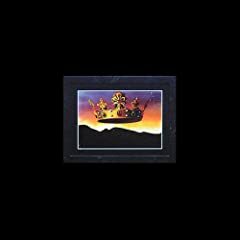 Sliding through you mind as you try to grasp it, this is a wonderful album to go to sleep with or set up an unobtrusive vibe in an otherwise silent room. It's a testament to the band that they were willing to branch this far out, but this is about as far from the quintessential OTC sound as you can get. 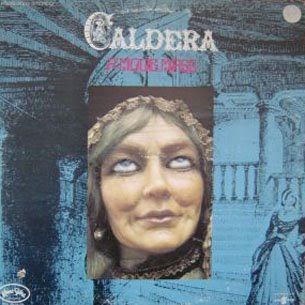 Continuing on the religious themed albums for the day, we find Caldera with their Moog Mass. This album hits me in a couple of soft spots. I'm typing these reviews out accompanied by my trusty Moog Voyager on the table, so obviously I've got a yen for hearing that sort of instrument. I also receive an irrational amount of enjoyment from the Electric Prunes' Mass In F Minor (admittedly even more that the legitimate Prunes releases), which this disc just seems to beg comparison with,. Now for those of your coming in for your Moog fix, this isn't necessarily the best place to find the signature space-defying filter sweeps. Much of the synthesis seems to be relegated to a somewhat annoying vox/vocoder sort of sound (I guess you'd run the mic through the filter and max out the resonance) while some of the harpsichord, strings, and organ sounds seem to be organic; that or these guys were master synth programmers, which I sort of doubt. "Who is the Man" does introduce us to a nice ball-busting synthetic brass sound that will continue through the album though, so you'll find something here to like. When the Moog does take on the organ parts, it's a lot of fun too. Ditching the rock and roll approach of Mass In F Minor, A Moog Mass stays relatively true to a solemn old school Catholic service, albeit filtered through a, uh, Moog filter. There's occasional narration from a fellow with a nice cultured accent who keeps making me think that we're going to slip into Moody Blues territory (this never happens if you're wondering). I guess it does approach a sort of 'Switched On Gregorian Chants' vibe, but the couple of acoustic instruments present fill up the sound and keep that from happening. Once again, like the Mass In F Minor this is an amazingly short album not quite topping out at 25 minutes. But it does provide a welcome contrast with that earlier disc. If your overly pious aut and uncle show up for a pious radish dinner while you're having a great booze-up in the next room, playing this will hopefully make everyone happy. P.S. - I think I hate this album cover. How could we go wrong with a tripped out, turned on, hip priest? Certainly not on this album. I mean we're not really looking at a lost classic, but if you've got an itch for some psychedelic exploitation with a practically incomprehensible religious twist, then this is the right place to turn. I know nothing about the good father beside the evidence in front of me. I grew up in the Episcopal church, and I'd wager that this is justified along the lines of some strange mission. Good for time, and demented sounds for us. Musically, this is pure psychsploitation. There is an anonymous backing band hitting the requisite fuzzed out guitar patches along with tripped out organs (not church organs) and some groovy backbeats. They do get some chances to shine as on the rollicking, almost-flying apart "Chalice." But the main act here is the spoken word voice overs of Father Berkery. I think that the idea here was to have a series of short sermons, but in order to stay hip and 'with it,' the religious rhetoric is laced with third-rate Jim Morrison-isms. That's why we end up with lines like "Bless me father, for I have sinned/Stop pushing; I am the next to get in" on "Confession." Also keep in mind that this is just after he's referred to the snakes slithering around the church pews. No, Fr. Berkery never shows any signs of actual musical ability; he's just here for the chicks as with William Shatner Transformed Man (at least I hope that's why Shatner was in the studio; there's no other rational excuse for that one). I guess he manages a few moments of white-priest filtered rapping on the almost funky "Seminary." Later, just the concept of "Celibacy" depresses me just a bit; but the good Father does have a nice psychedelic explanation of it. "Preaching" comes acroos like the rightfully long-lost Byrds collaboration; actually make that with second-rate Byrds soundalikes. This isn't really something that you're going to cruise around town groovin' to. 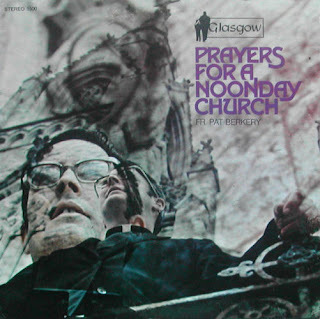 But if a psychedelic album with a priest on the cover intrigues you, I don't think that this will disappoint. It's certainly something that would be fun for your next party playlist.